Thank you to Log Cabin for sponsoring my post about updated traditions in my household. To learn more about Log Cabin Syrups (which are all free of High Fructose Corn Syrup), breakfast for dinner, and other new ways to update traditions in your home, click here. I was selected for this sponsorship by the Clever Girls Collective, which endorses Blog With Integrity, as I do. My husband and I have found that our children have improved and enriched our lives so much. We've learned so much from them, and I think we're all-around better people because we have our children. Having children has also made both of us realize that family is incredibly important to both of us. We want our kids surrounded by family, just like we both were as we were growing up. I have a dear Grandma JoJo, my parents, a brother and his wife and a sister, her husband and their four amazing children. Plus, I have an aunt and uncle that I'm really close to! My husband has his parents, plus a sister, brother, brother-in-law and their children, too. Unfortunately, only a small handful of those close family members leave near us (and by “near” I mean 30 or 40 miles away). While our actual families are tremendously important, it makes me realize that it's up to me to show Haiden and Piper that “family” can mean so much more than those who are related to us by blood. I've recently come to realize that my friends and I have made our own families among each other. From the joys of getting married, graduating and having babies to the challenges and heartbreak of medical issues, fertility problems and job loss, My close friends and I have been there for each other through it all! Like any other family, ours has grown and expanded to include husbands and babies, along with other wonderful ladies who mesh right in with the rest of us. Those expansions mean that we don't always have spare time to spend together, but sometimes occasions are created just so we can be sure to see each other and make sure we stay current on each others' lives. We're used to meeting for dinner at fancy restaurants, but, as my friends continue to start families (and watch my family grow), they've come to sympathize with me over the challenges of finding a child-friendly and crowd-pleasing restaurant that will accommodate at least four couples and three high chairs, especially on short notice! One thing I'll be doing in the near future is planning brunches at my home so my friends can bring their families so we can all take it easy and have a good time together. This way, no one has to get their kids dressed up to go “out”, and all of the little ones can relax in our baby-proofed home! This type of get together with my friends and their families doesn't replace the times I get to spend with my own relatives, but the closeness and companionship I feel with those ladies is a wonderful substitute for the family I can't see all the time! 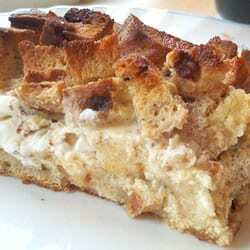 Of course, I can't mention brunch without a recipe, so here's a lovely one for Apple Cinnamon French Toast Strata. It's perfect for a brunch gathering, and it's low stress since the entire thing can be prepped the night before. I've made it in the past and it's wonderful! Soften the cream cheese in the microwave until practically melted. Toss cubed bread with cream cheese. Arrange 1/2 of the coated bread in the bottom of the dish. Top with the apples. Top with remaining bread. In a large bowl, beat the eggs with the milk, butter, and maple syrup. Pour over the bread mixture. Cover with plastic wrap, and press down so that all bread pieces are soaked. Refrigerate at least 2 hours. Bake 45 minutes in the preheated oven. Let stand for 10 minutes before serving.